This colorful array of goodness has been my favorite salad since I was a tiny little girl. 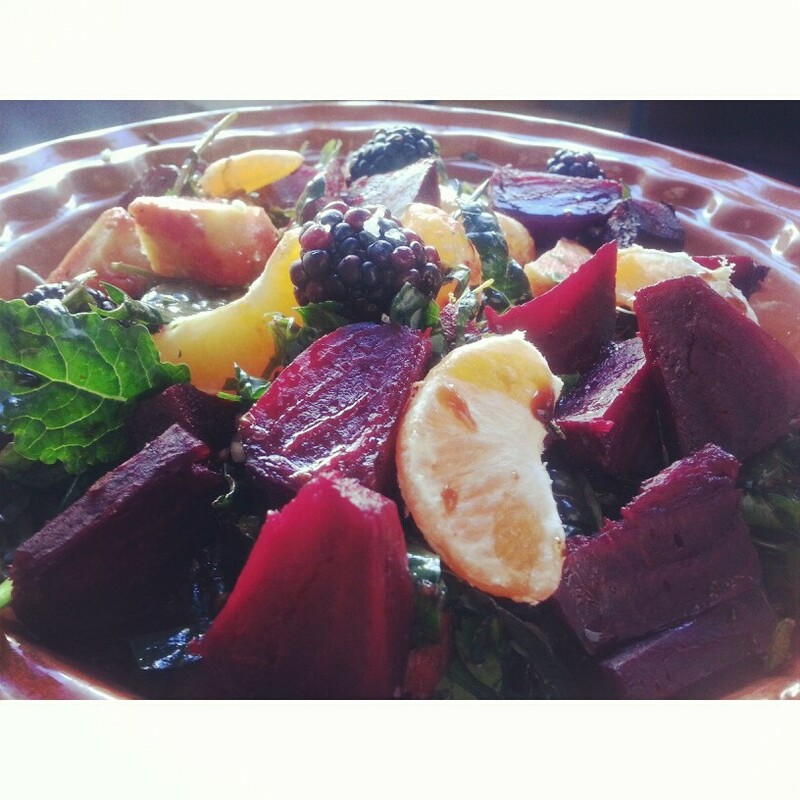 I have always adored beets, their rich varying colors, their earthy robust flavor. Simply sent from the divine. In this dish the roasted beets give way to the sweet juiciness of blackberries, and then a tart blast from the tangerines all evened out by the grounded baby kale. The balsamic reduction that is added with the warm beets becomes a caramelized sensation that brings you on a journey you will want to take again and again. This dish brings together simple, seasonal ingredients and takes you back to what nourishment from food is all about. Get ready to crave this daily!! Wash beets well, you can save the greens if you wish and make delicious sauteed beet greens. Place washed beets in a roasting dish. Rub olive oil, salt and pepper all over them and place in oven at 350 degrees Fahrenheit. The beets will take about an hour to an hour and half depending on size. You want them soft yet firm. While the beets are roasting, prepare the kale and herbs. Wash the kale well, if you are using bunches of lacinato kale, de-stem it first and then wash well. If using baby kale just wash well and add to your favorite salad bowl. Chop basil, parsley and garlic cloves. Add to bowl with kale. Zest one lemon and one tangerine and add zest to salad bowl. Massage all with some balsamic vinegar and olive oil. Add tangerine and blackberries. When the beets are finished roasting take them out of the oven and allow them to cool on a cutting board. Once cool peel the skin off and slice however you wish. Now for the balsamic reduction. You will put the two cups of balsamic in a pan over medium heat, feel free to add lemon zest or herbs of your choice. Let the balsamic reduce for about 5-7 minutes. It will reduce to a gorgeous thick syrup. Pour this reduction right over the warm beets in the salad and then toss the salad together. You can also add fresh squeezed lemon juice for an extra punch! That is all. Simple ingredients, exquisite taste.